A Sheffield shop worker who was threatened with a knife during two armed raids in the space of three weeks has called for the police to do more to catch the culprits. 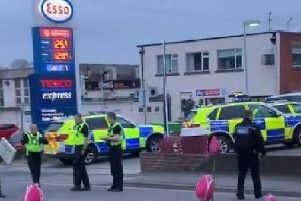 The 38-year-old mum, who works at McColl's on Margetson Crescent, Parson Cross, was forced to the back of the shop and ordered to open the safe and tills during a terrifying raid last Sunday night. One of the two robbers, who was armed with a machete, threatened to 'cut' the woman and her colleagues unless they complied with their demands. They escaped with cash and alcohol. Just three weeks earlier - on Friday, March 16 - a man who was brandishing a knife also stole cash from the safe during another raid. Today, a woman who was working in the shop on both occasions, said: "These are happening on a daily basis and those involved seem to be getting away with it. "There are too many of them happening and not enough police officers. They seem to be running rings around the police. "Last Sunday when officers were dealing with the last robbery at the shop they got details over their radios of another one in Sheffield just a few minutes after ours - they are happening all over the place." She is calling for the police to release more details of all the incidents. "People don't realise how many of these armed robberies are happening day in, day out in Sheffield and surely it is only going to be a matter of time before someone is seriously injured or even worse. People need to know what is happening," the woman added. "One of the men involved on Sunday was horrible - he was swearing, aggressive and giving his orders while saying that he was going to cut us. It was horrific not knowing what was going to happen. "I have no doubt at all that he is capable of hurting someone and using that knife the next time he targets a shop. Is that what it is going to take before something is done about this because it is horrific getting caught up in these and now we are wondering when it is going to happen again." Figures recently released under the Freedom of Information Act revealed there were 99 robberies at business premises in Sheffield last year. DC Zareen Gulzar, of South Yorkshire Police, said: "I understand incidents of this nature cause concern amongst the local community and dedicated teams of officers have been conducting extensive investigations to identify those responsible. "Our priority remains keeping all of our local communities safe and we continue to work in partnership with our local businesses to provide reassurance, advice and support. "I would like to reiterate that incidents of this nature are not tolerated by South Yorkshire Police and provide reassurance that high visibility patrols have now been place in the area. We also have a numbers of plans in place to tackle this type of criminality, remove threats from our communities and bring offenders before the courts."